Home > Light Duty V Belts > FHP V Belts. 2L through 5L Sections... > 4L Light Duty V-Belts (FHP) 4L Sections - CLICK HERE! > 4L350 FHP V-Belt. Consumer Brand. > A33 Bando V-Belt > AX33 Molded Notch V-Belt. AX Series. AX33 Belt. 35 inch Length (O.C.) 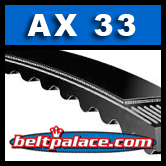 AX-33 REPLACEMENT V-BELT. Molded Notch or "Cogged" V-BELTS reduce friction and provide a better fit around smaller pulleys. We recommend trying Cogged v-belts if you have performance issues with regular "A Section" smooth v-belts. Specs: 1/2" (13mm) Wide, 35" (889mm) Length. 4L350 FHP V-Belt. Consumer Brand. 1/2� W x 35" Length. Replaces Classical A33 V-Belt on light duty applications.